Risborough Rangers pulled off a remarkable victory on Saturday when they won a nine-goal bonanza 5-4 over Hillingdon Borough thanks to a dramatic 98th minute winning goal, just four minutes after the home side appeared to have rescued a last-gasp draw themselves. 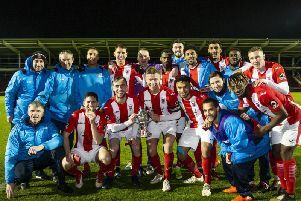 Rangers trailed 3-1 at half-time but stormed back in the second 45 minutes with three goals to take a 4-3 lead and though Hillingdon scored a 94th minute leveller, Alex Woodfine had the final say deep into stoppage time to maintain his side’s 100 per cent record this season. Risborough began brightly at the Middlesex Stadium and created a few half chances but two quickfire goals put them behind as a free-kick somehow found its way into the back of the net on 10 minutes and shortly afterwards, a penalty, rightly awarded, was converted by the home side. Sam Ward pulled one back for Risborough when he controlled a long pass, rounded the home side’s goalkeeper and tucked the ball home on the half-hour mark, however Hillingdon restored their two-goal cushion on the cusp of half-time with a great finish from the edge of the box. There was a real determination from Rangers in the second-half and they were rewarded with two goals early on, Ward again dispatching the game’s second penalty after Lamar Mason-Williams was brought down in the 63rd minute, before Joel Read smashing in an equaliser from a corner two minutes later. Both teams went for the win and played some great football, and Rangers seemed to have done enough to come away with victory when Chris Davies, who found himself furthest forward on the right wing, tucked in their fourth. Hillingdon refused to buckle, however, and a long throw was not dealt with, leaving the home striker unmarked inside the penalty area and he poked beyond Lee Parrack yo seemingly ensure the spoils were shared. But as the game went beyond 97 minutes, there was to be one final twist in store when new signing Alex Woodfine timed a superb run through the middle and kept his cool to smash home from 18 yards, sealing the most dramatic of wins for Risborough. With these three points adding to the three successive wins already recorded this season, Rangers are now joint top with Ampthill Town in South Midlands League Division One and that’s having played fewer games. Risborough are away to Arlesey Town Reserves this Saturday, while next Tuesday, they host their co-leaders, Ampthill, in a 7.45pm kick-off.